“Former Team USA member and #1 ranked 165lber Williams is the latest amateur talent to pen promotional terms with promoter Eddie Hearn,” Matchroom claims, via press release, “and the 22 year old Houston talent brings a formidable body of work into the paid ranks.” Williams, has twice been a USA Boxing Western Regional Champion, as well as a two time Houston Golden Gloves Champion. He was also named Gulf Association’s Most Outstanding Boxer in 2017. Such an amateur resume has made the fighter a hot commodity as he prepares to enter the pro ranks. “I’m delighted,” says Hearn, “to welcome Austin ‘Ammo’ Williams to the Matchroom Boxing USA team. 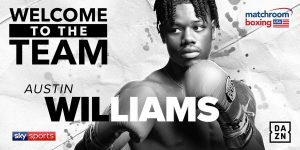 Ammo is one of the most exciting young amateur fighters I have seen and in just 47 amateur fights has established himself at #1 in his weight class.” Williams is said to compete at middleweight with the possibility of moving up to super middleweight. At the moment, the DAZN streaming service airs the fights of Canelo Alvarez, Demetrius Andrade, Daniel Jacobs, and (possibly) Gennady Golovkin. William’s management team is also happy with the signing. “Austin Williams possesses all the qualities you want in a fighter,” Churchill Management’s Sam Katkovski says. “Beyond his viciousness in the ring, he will amaze fans with his personality and quickly become must see tv. We at Churchill are excited to partner with Matchroom Boxing USA to begin his career journey.” Williams, according to Matchroom, will “join (the) paid ranks in April.” No opponent or overall schedule has been named in the Matchroom press release.